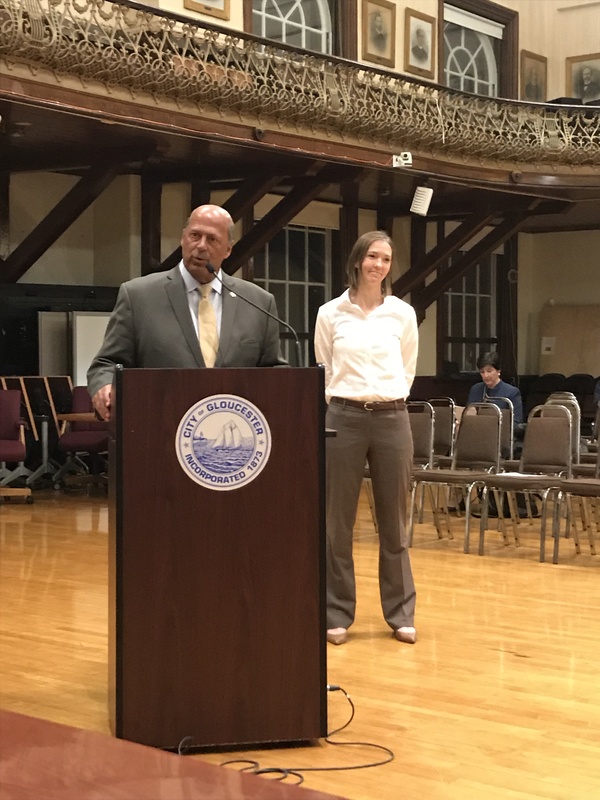 GLOUCESTER’S “PIPING PLOVER PLAN” REVIEWED BY KEN WHITTAKER AND MEET ADRIENNE LENNON, GLOUCESTER’S NEW CONSERVATION AGENT! 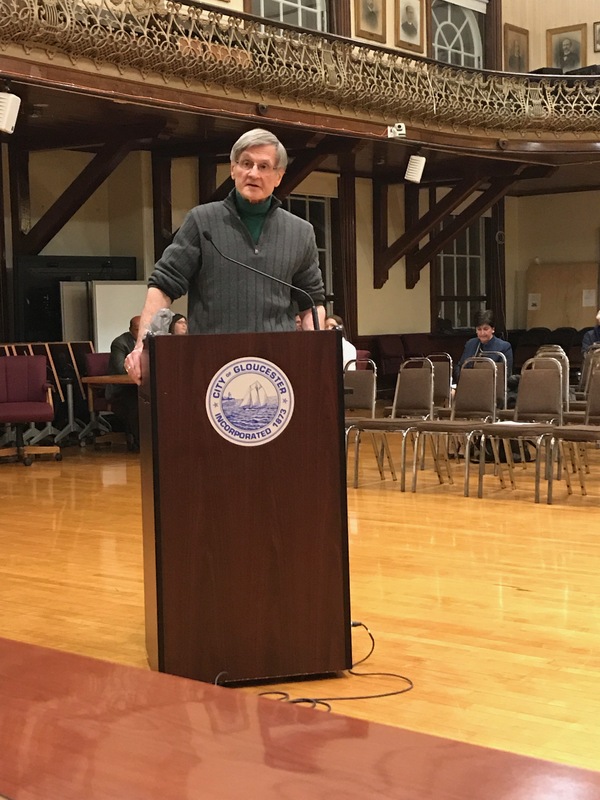 Tuesday evening at the City Council meeting, former Gloucester conservation agent Ken Whittaker reviewed the City’s 3PPlan (Piping Plover Plan) with the Councilors. 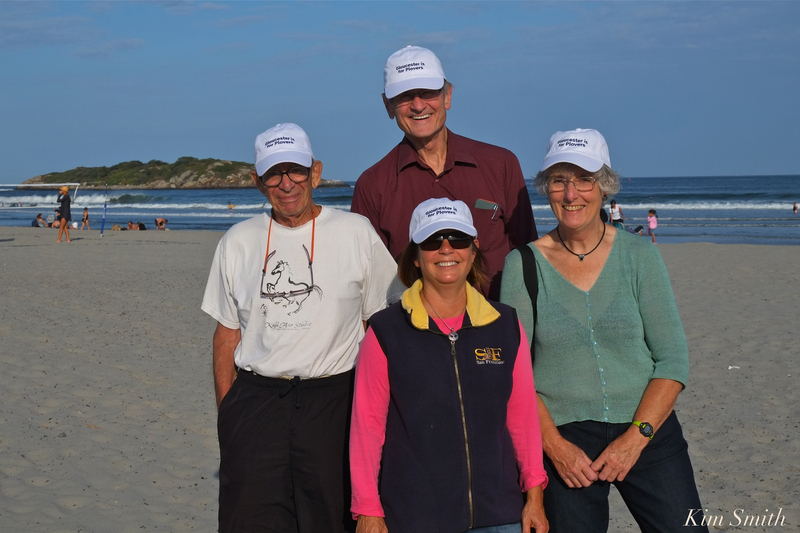 We Piping Plover volunteer monitors are grateful for the time and effort Ken has put forth in helping to protect our threatened Piping Plovers. We’re especially appreciative of the time he spent coordinating the volunteer monitors–not an easy task! We wish Ken all the best in his retirement. Ken and Jim Destino introduced Adrienne Lennon, Gloucester’s new conservation agent. We had a few minutes after the introduction to speak with Adrienne. Her experience includes working for seven years at Mass Audubon’s Joppa Flats Education Center, located in Ipswich on the Plum Island causeway, adjacent to the infamous Pink House. 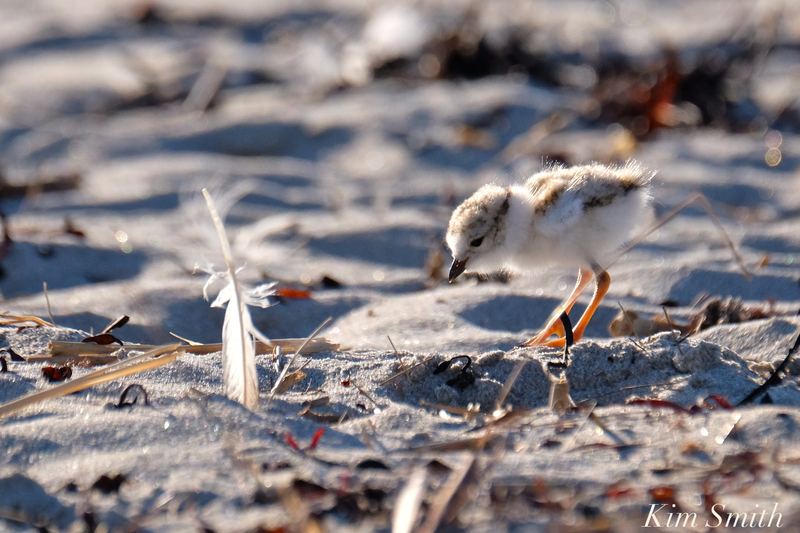 While there, Adrienne gained extensive knowledge in Piping Plover conservation. She is especially interested in preserving and protecting our beach dunes. Adrienne can be reached at alennon@gloucester-ma.gov. Best of success to Adrienne in her new position as Gloucester’s Conservation Agent! During Piping Plover nesting season, I have visited the public beach at the northern end of Plum Island, Newbury Beach. I believe the PiPl nesting areas at Newbury Beach are monitored by Mass Audubon’s Joppa Flats Education Center. Newbury Beach is similar in several ways to Good Harbor Beach in that it is a popular town beach in a residential area with many access points and nearby hotels. Last year the beach and dunes were extremely hard hit by late winter storms, just as was Good Harbor Beach. About Joppa Flats Education Center: Overlooking the Merrimack River and near the entrance to Parker River National Wildlife Refuge, the Joppa Flats Education Center offers unique educational opportunities for people of all ages. Here, you can explore the region’s wildlife-rich habitats (salt marshes, mudflats, rivers, bays, and coastal waters) through guided tours, marine touch tanks, art exhibits, drop-in programs, and interpretive displays. Scenes from behind the Joppa Flats Education Center and Plum Island causeway. 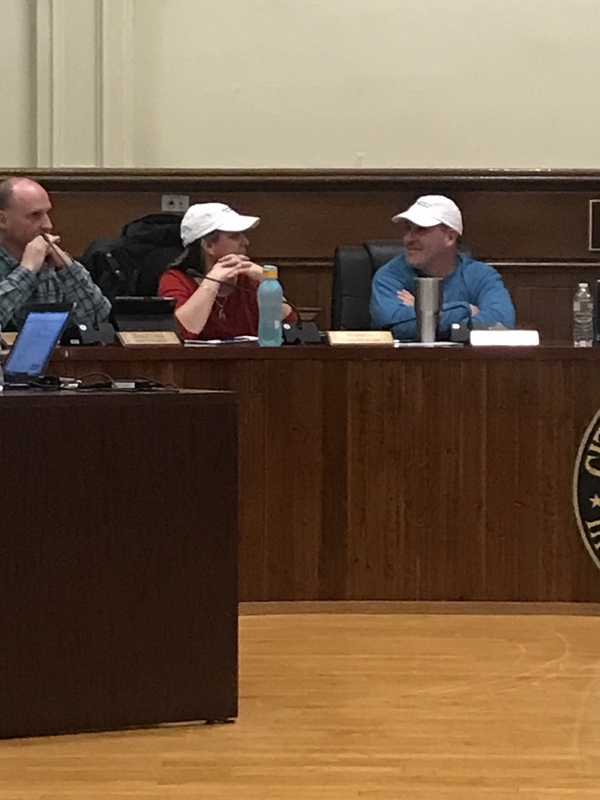 Councilors Steve LeBlanc and Melissa Cox wearing Piping Plover monitor hats provided by Ken Whittaker. 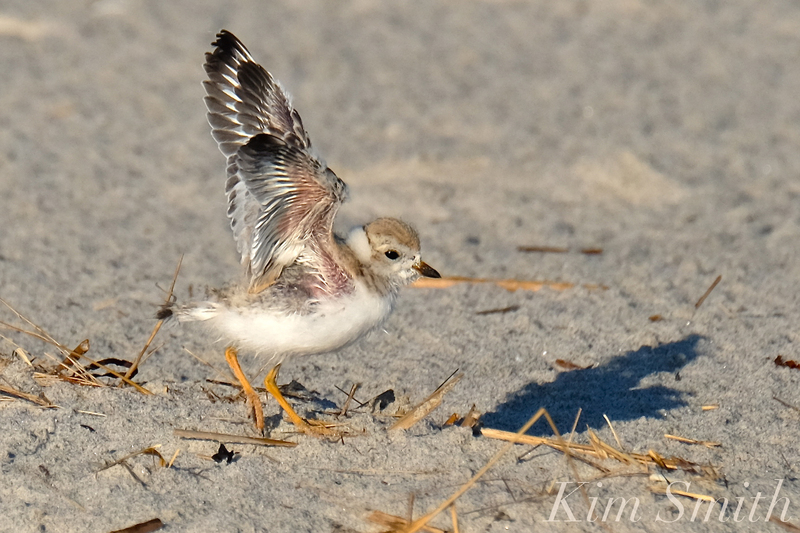 Coffins Beach and Wingaersheek Beach are going to be more closely monitored this year for Piping Plovers. The above photo is from 2016 when NINE chicks fledged at Coffins Beach! This entry was posted in Birds, Birds of New England, Gloucester Plover, Good Harbor Beach, Life at the Edge of the Sea, Piping Plover, shorebirds and tagged Adrienne Lennon, Beautiful Birds of Cape Ann, Charadadriidae, Charadrius melodus, Coffins Beach, Councilor Scott Memhard, Gloucester Conservation Agent, Good Harbor Beach, Joppa Flats Education Center, juvenile Red-tailed Hawk, Ken Whittaker, Mass Audubon, Melissa Cox, Piping Plover volunteer monitors, Piping Plovers, Steve LeBlanc, Wingaersheek Beach on March 13, 2019 by Kim Smith.